One dollar per pay period, that's all it take to make a huge difference toward honoring the memory of our fallen brother aviators. On the 16th anniversary of that horrible day we invite you to make a modest financial commitment that will help keep their memory alive. Each of the four pilots that were lost on 9-11-2001 have memorial funds established that are linked to on this site. We recommend gifting at least a "buck" every pay period to each charity, of course you're welcome to contribute more! If you're a United Airlines Employee, donating couldn't be easier, please click the United Link above to learn more. If you're not a United Employee, links to each pilot's memorial fund can be found in their bio. Did you know that United Airlines Employees can make regular and automatic charitable contributions to any or all of these memorial funds through the United Employee Your Cause portal? 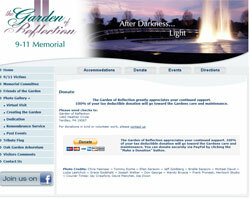 Your donations are automatically deducted from each paycheck and gifted to your selected charities in your name. Setting the automatic gift is easy and giving just buck in memory of our fallen brothers makes a difference. To set up this simple way to give Click Here. If you would like step by step instructions on how, Follow This Guide! Jason was the Captain of United Airlines Flight 93 which was hijacked at 9:28am on September 11, 2001, subsequently crashing at 10:02am in a field near Shanksville, Pennsylvania instead of its intended target, the US Capitol Building in Washington D.C. It is believed that the hijackers were subdued by the heroic actions of the passengers and crew on board. 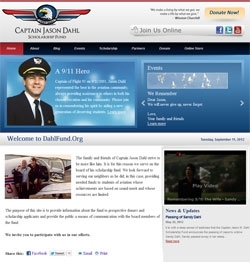 In 2002, the Captain Jason Dahl Scholarship Fund was established to provide two deserving aviation students a scholarship grant in Jason's name. Originally available to students at Dahl's Alma Mater, San Jose State University and Metro State University in Denver where Dahl lived, the program has since been expanded to NATIONAL status as an IRS recognized 501(c)3 non-profit program supported through corporate and individual donations alike. On the morning of September 11th, 2001, United Airlines Flight #93 had 37 passengers including the two pilots, five flight attendants and the four hijackers. The pilots had received messages from United Airlines dispatch that said "beware of cockpit intrusion. 2 ac [aircraft] have hit the wtc." Melodie Homer also sent a message to her husband via the cockpit computer system. When the cockpit door was breached, FAAís air traffic control center in Cleveland could hear LeRoy Homer declaring "Mayday" amid the sounds of a physical struggle in the cockpit. According to the official transcripts of the cockpit voice recorder from the flight, the hijacking took place 46 minutes after takeoff, and the plane turned toward Washington, DC. It was later determined the plane was headed for the US Capitol. As the hijackers attempted to fly the aircraft, the passengers and flight crew using GTE Airfones called family, friends and found out about the other attacks. The passengers were determined to take back the plane. What they didn't realize was the automatic pilot had been manipulated in a way that made it difficult for the hijackers to fly the Boeing 757. They are heard on the cockpit voice recorder saying "This does not work now." and then a minute later "Inform them, and tell him to talk to the pilot. Bring the pilot back." The pilots were the first to fight the terrorists, and along with the crew and passengers saved Washington, DC from an attack. Vic Saracini came to Socorro from Atlantic City, N.J., and was a 1976 graduate of New Mexico Tech with a bachelor’s in general studies. After he graduated from Tech, he served in the Navy, where he trained as a pilot. He worked for United Airlines for about 16 years. He was the captain of United Airlines Flight 175, which was crashed into Tower I of the World Trade Center by terrorists. He was survived by his wife, Ellen, two children, Kirsten and Brielle, and many Tech friends who remember him fondly. Michael Horrocks was serving as co-pilot on United Flight 175 when he called his wife, Miriam, to say hello. According to news reports confirmed by a family member, Horrocks called his wife before the plane took off and joked that the pilot--Victor Saracini--was "some guy with a funny Italian name." The 38-year-old native of suburban Philadelphia had two children, a son in 1st grade and a daughter in 4th. Miriam Horrocks is a gym teacher at a nearby grade school, the family member said. His plane crashed into the south tower of the World Trade Center. Horrocks was a retired Marine and was a quarterback at West Chester University in West Chester, Pa.